Homemade black Angus meatballs have a secret finishing trick to deliver maximum flavor. Meatball and spaghetti season has arrived. And Atticmag’s favorite recipe chef Lisa Deyo —who lends her talents to the recipe testing and photography for this blog — makes some really mean homemade black Angus meatballs from her Italian family recipe, which she’s sharing here. Two things about Lisa’s all-beef meatballs stand out: first is that she prefers ground black Angus beef (80% lean 20% fat ideally) for it’s excellent flavor. Second, is that instead of traditional breadcrumbs (which are perfectly fine) she likes to use dry, flaky Japanese panko breadcrumbs to keep the meatballs tender. Panko and milk are the binder here — the recipe has no egg. Most of the other seasonings for the meatballs are dry pantry items for most kitchens. The meatballs start out with a panko/milk base to which all the remaining seasonings are added. Chunks of the ground black Angus beef tops off the seasoning mixture. 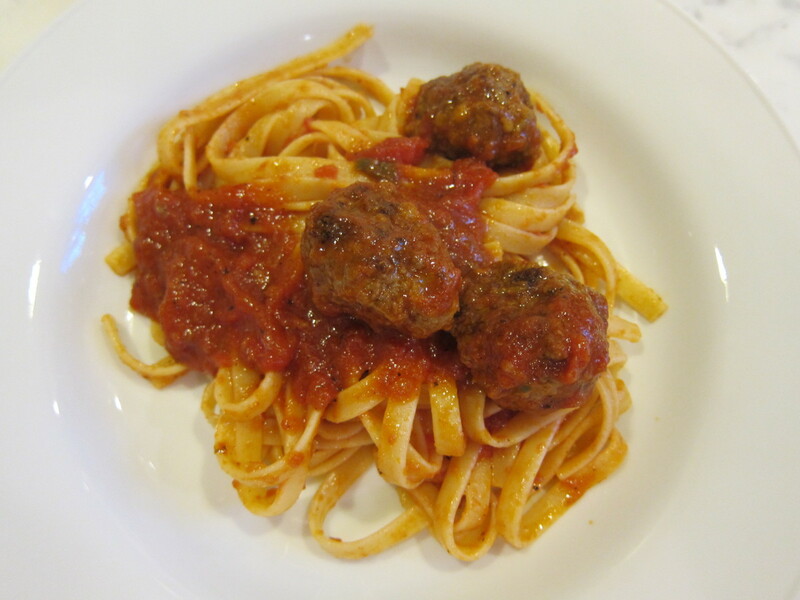 Lisa believes the meatballs are best when the mixture is worked just enough to mix it thoroughly, but not too much — it should look a little marbled. Then she uses a tablespoon to measure out 24 little spheres — a great yield from one pound of ground beef. Continuing with her light touch (Lisa comes from a family of artists) she just pushes the scoop of meat mixture into little balls. And rather than dirty another dish, the meatballs just get stacked up the side of the mixing bowl until it’s time to cook them. Browning the meatballs takes just a few minutes because they don’t get completely cooked — that’s one of the secrets to the success of the recipe. The meatballs are cooked rare and then drained on paper towels. Then they go into the prepared sauce (either homemade or a high-end prepared brand like Rao’s or Bertolli organic). After a few minutes of simmering, the meatballs are cooked and their cooking juices have also enhanced the flavor of the sauce! We had fettuccine on hand so we used that instead of spaghetti but that doesn’t change the way the cooked pasta is handled. Once drained, it’s tossed in a little olive oil to remove excess liquid. Then, about half the sauce is tossed with the pasta to coat it with flavor. Finally, the pasta and sauce are ready for the black Angus meatballs and additional sauce on top — the perfect finish to a family favorite. 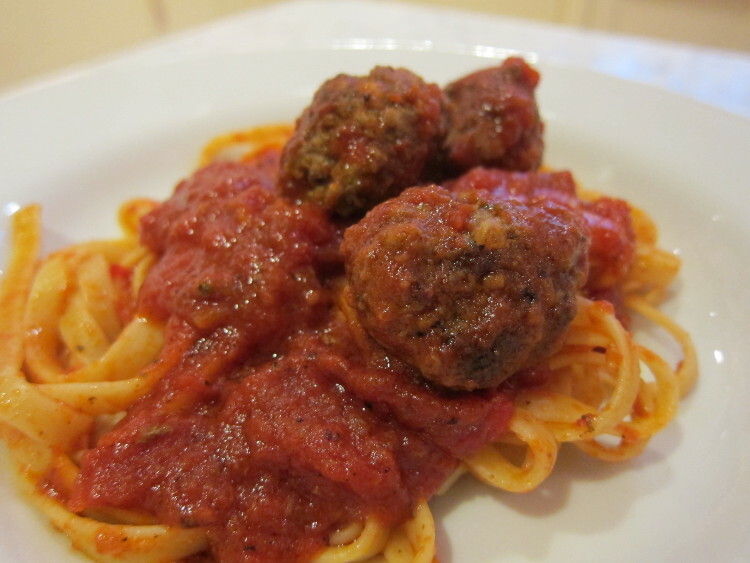 Black Angus meatballs are lightly browned then finished in the pasta sauce for extra flavor. In a large bowl, combine the panko bread crumbs and milk. Mix together until all the bread crumbs are soaked and form a wet paste. Stir in the Parmesan cheese, herbs, salt, pepper, garlic powder, onion powder and Worcestershire sauce until well incorporated. 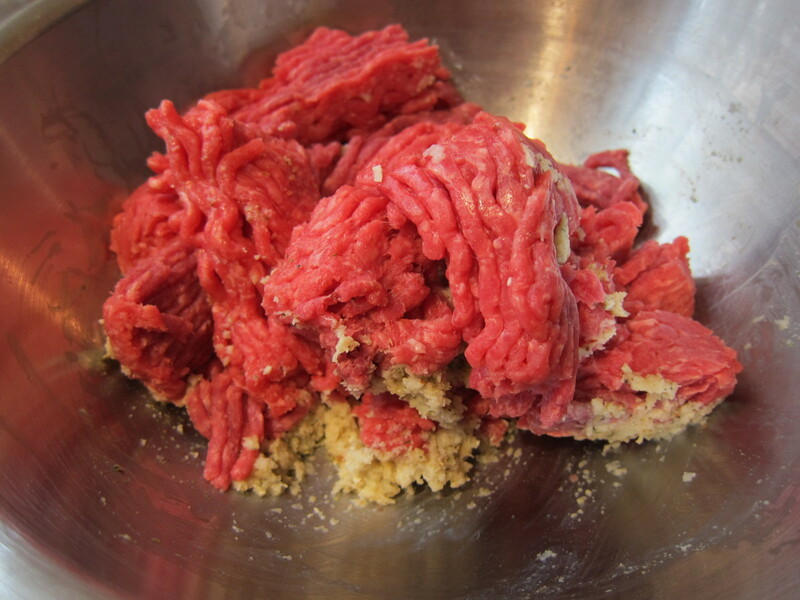 Break up the ground beef and add the chunks to the bowl. Slowly mix it into the seasoned bread crumbs using a spatula or spoon, but using your hands may be easiest. 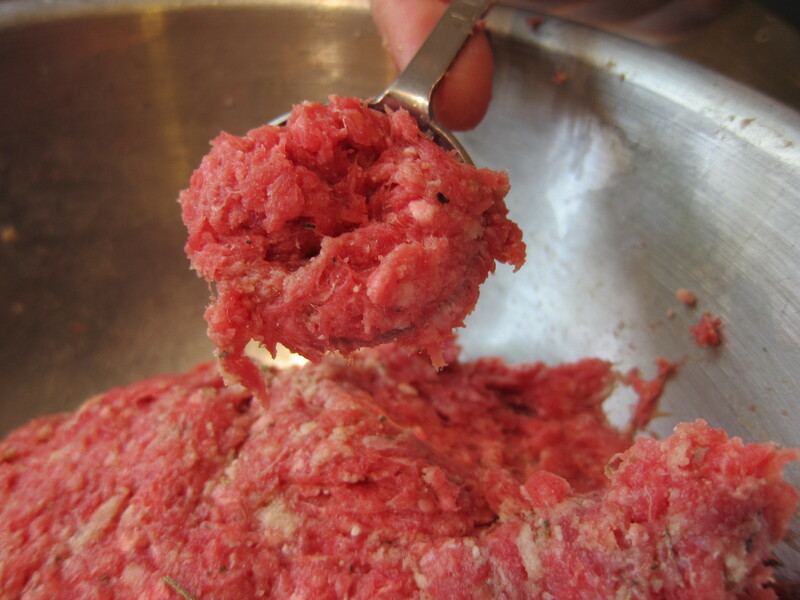 Very important: do not overwork the mixture or vigorously knead it as this will toughen the meatballs. 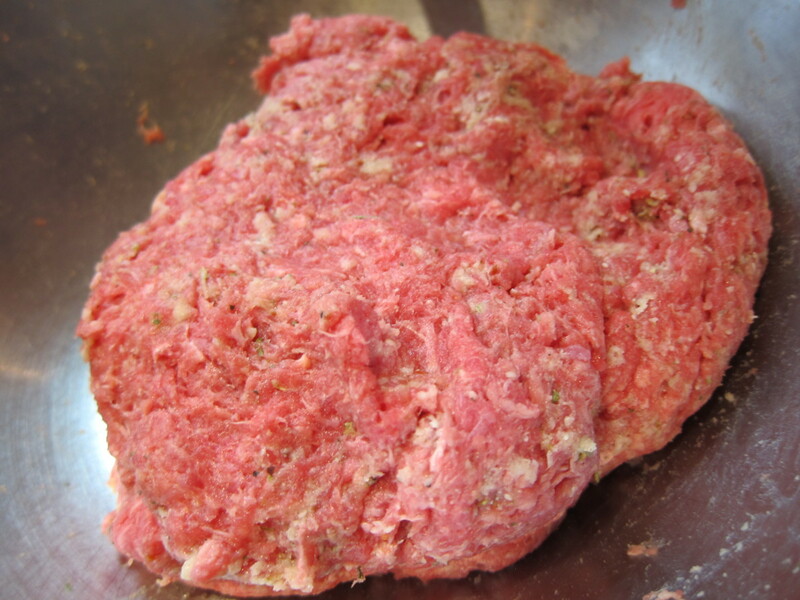 Mix just until the ground beef and seasonings are combined. The mixture should look marbled. Using a 1 tablespoon measuring spoon, scoop up a rounded spoon of meat mixture. 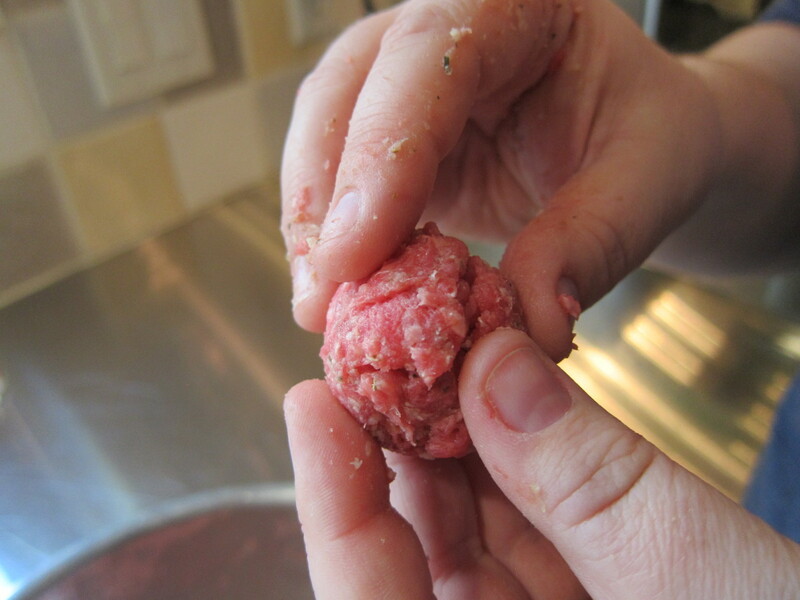 Drop it into your hand and gently push the meatball into a sphere — do not roll it around or compress it. Again, overworking the meatballs is not recommended. 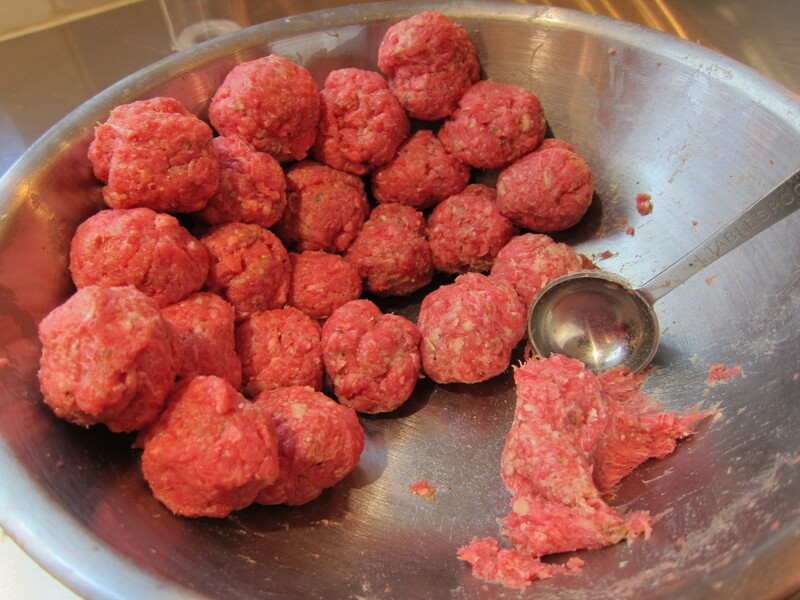 As you work, the meatballs can be stacked against the side of the mixing bowl. 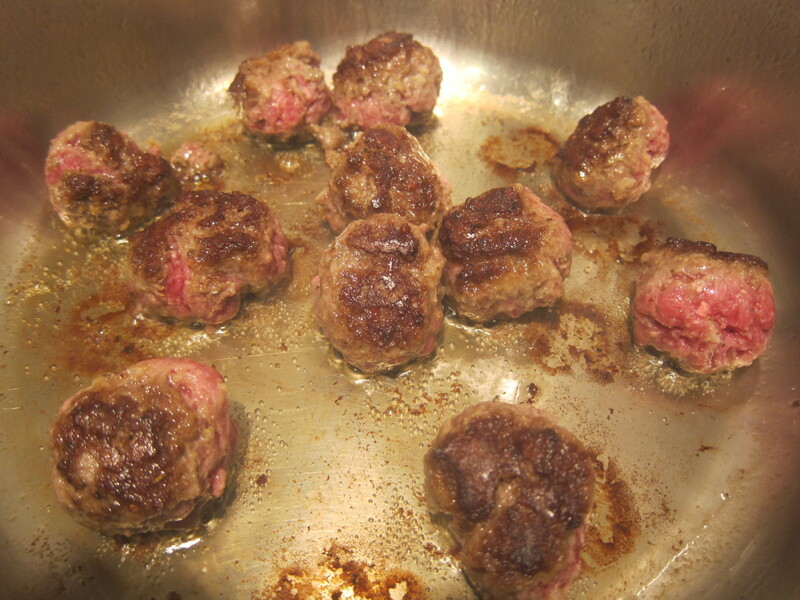 To pre-cook the meatballs, heat 2 tbsp of the olive oil in an 8 to 10-inch skillet or Dutch oven over medium heat. Brown them them in batches on all sides for 2 to 3 minutes, turning as needed until there is a nice golden brown crust on the outsides. Do not overcook or worry about rare areas as they will eventually finish cooking in the sauce. 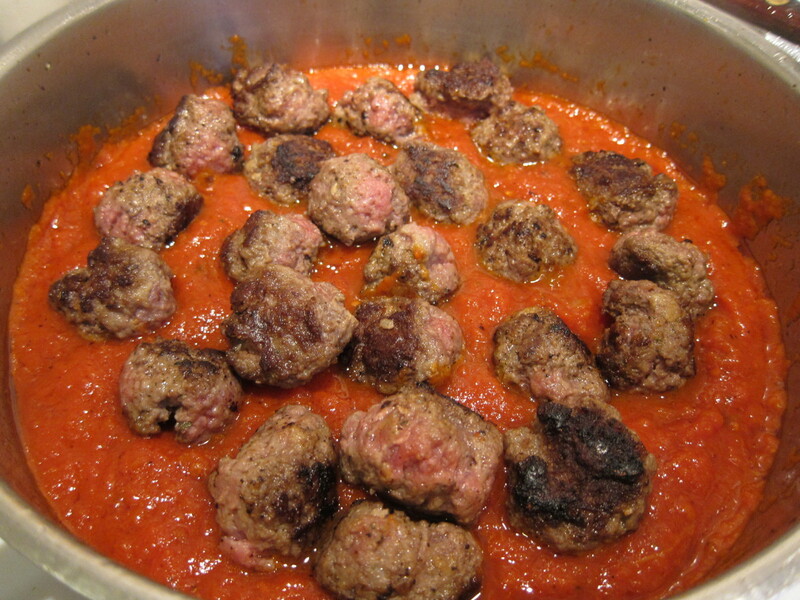 When meatballs are browned, remove them from the pan to a paper towel- lined plate or dish. Drain off excess oil from the skillet or Dutch oven, clean, dry and return it to the stove. Add 3 cups of pasta sauce and the meatballs. Slowly simmer the meatballs in the sauce for 6 to 8 minutes until the meatballs have cooked through and the centers are no longer rare. 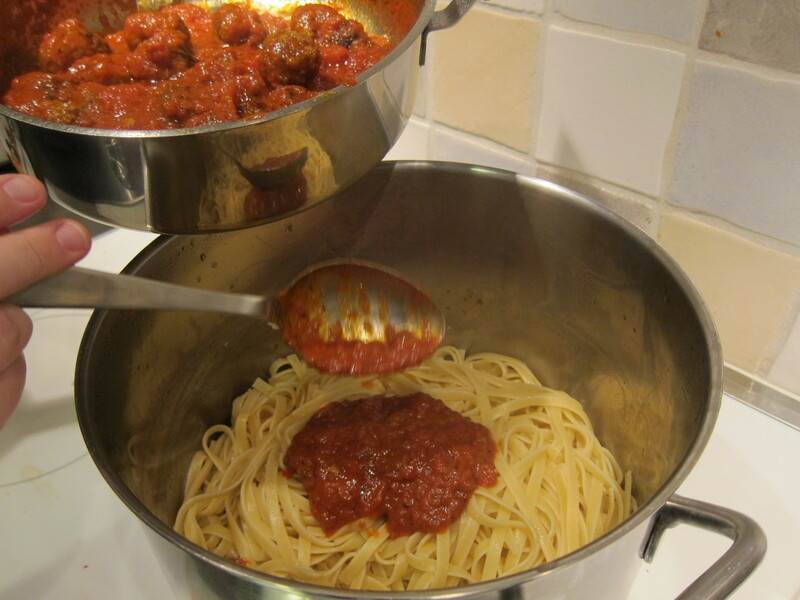 To combine the meatballs and sauce with pasta, cook the pasta in a soup kettle with 6 to 8 quarts of salted water according to package directions. 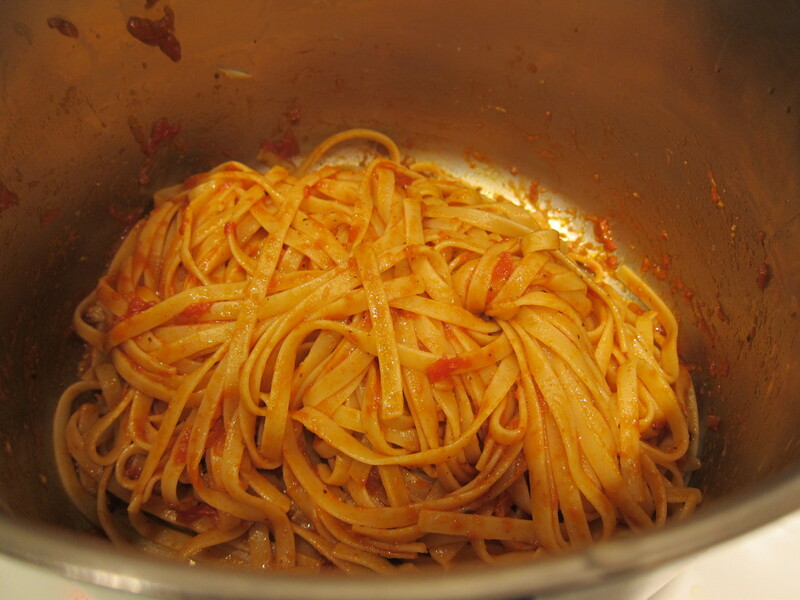 Drain in a colander and immediately return the pasta to the soup kettle with the remaining 2 tablespoons olive oil. Toss in oil off heat to evaporate excess water and seal the pasta. Holding meatballs back, spoon half the tomato sauce over the pasta and toss throughly. 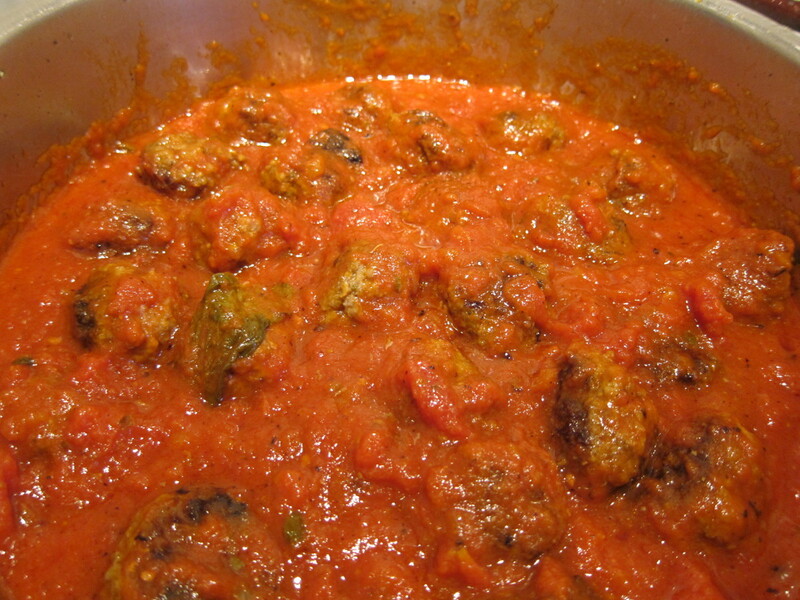 Serve on warm dishes garnished with meatballs and the additional sauce. If ground black angus is not available, use an 80/20 blend of ground beef. Or, try a combo of ground black Angus beef with pork which my mother used to do sometimes. The Italian seasoning I used contained basil, oregano, thyme, and rosemary. Some contain garlic and onion as well, be aware. Others include red pepper flakes. If you like a kick, you can add 1/8 tsp of red pepper flakes to the meatballs. If you don’t have, or can’t find panko, substitute regular bread crumbs that are not seasoned. By finishing cooking the meatballs like this, you will get a heartier, more homemade tasting sauce that will seem like you slaved over it for hours. 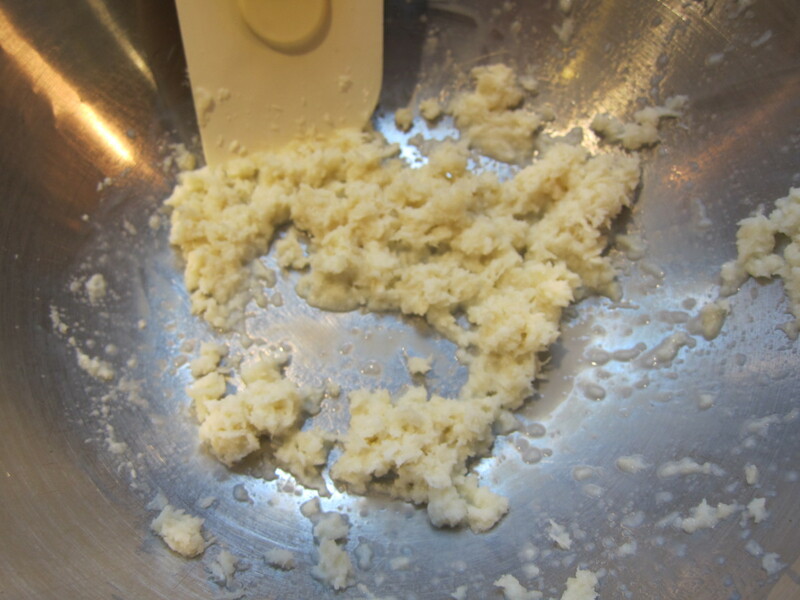 Additional ground Parmesan cheese can be sprinkled over the finished dish but beware that cheese adds salt. I like to taste before adding grated cheese.